We took a break from dining out this week and ordered in. In 1999, I killed off a dot-com delivery service. I didn’t intend to, and I didn’t do it alone; it took tens of thousands of us to ignite the venture-capital-funded, hydrogen-inflated blimp that kept fee-free, no-minimum-order Kozmo.com aloft. A true confession: My frequent 2:30 a.m. orders of a single, 59-cent banana certainly didn’t help matters. Twenty years later, the newest generation of internet-enabled food delivery services is working hard to prove that – with the right pricing model (and a few strict minimum order guidelines) – dining in while dining out can be good business. Over the past few weeks, I placed orders with all the area’s delivery services and spoke with couriers/drivers and company owners to learn about how the businesses work. I even joined several online communities to read more and ask questions about what employees really think of their work (and often demanding clients). Always tip – it is more than just good karma. If you have ever ordered a pizza, this will come as no surprise. Yet drivers say around 30 percent of customers don’t bother. While delivery couriers earn most of their money on a per-mile or per-minute basis, in many cases, tips make up a significant part of their income. Also, with the national apps (GrubHub, DoorDash, Uber Eats and Postmates), couriers are not normally paid for the leg of their trip that takes them to the restaurant to collect the diner’s order – only for the second half, when they deliver to the customer. In 2016, former Eater.com editor Helen Rosner proposed that $5 should be the absolute minimum for tipping any delivery driver, for any order. In a large city, that’s good advice. In a place like Portland, where costs are lower, you could probably get away with $4, but tipping a five-spot is a good guideline, even here. Make it easy for your driver to complete the delivery. If you have an obscured house number, broken doorbell or tricky street-parking complications, include that information with your order. On Facebook, one Doordash driver recently shared her customer’s special guidance to “brace yourself for the extremely loud dog barking that will come from behind you, then knock.” Better the Dachshund you know than the Doberman you don’t. Be home when your delivery arrives. If this sounds like it falls under the rubric of common sense – of course it does. But a frequent subject of online complaints among app drivers is that diners sometimes make them wait, allowing more time for food to get cold (further reducing tips), and leaving the driver unable to accept another order until the current one has been completed. Uber Eats gives couriers a timer that starts a 10-minute countdown when the driver arrives at the destination. If the timer gets to zero, the driver gets paid in full and gets to keep your food as a bonus. To evaluate each of Portland’s delivery services, I ranked each using Dine Out Maine’s five-star rating system, weighing ease-of-use, selection of restaurants and variety of cuisines offered, total cost, wait time and my own interpretation of whether the company’s drivers seem to like their jobs. I also promise that, in researching this article, I tipped appropriately and most importantly, did not place any orders for a single banana. Sometimes, it’s hard to beat a local expert, especially one with a good reputation among restaurants (I spoke with one restaurateur who, off the record, raved about the quality of his interaction with CEO Mike Bolduc and his team). 2 Dine In’s roster of restaurant partners tops 100, offering food as varied as pork schnitzel (Other Side Delicatessen), Sicilian pizza (Slab) and cactus-blossom pupusas (Flores). Deliveries generally arrive when they are supposed to, although the back-end technology seems to sandbag expectations by frequently proposing wait times that exceed an hour, even when the actual delivery arrives far sooner. Fees: $4.99 for deliveries to Portland and South Portland. $6.49 to parts of Cape Elizabeth, Falmouth Foreside, Scarborough and Westbrook. Check the app or website to confirm that your address is eligible. Hours: Sunday to Thursday, 11 a.m.-8:50 p.m., Friday & Saturday, 11 a.m.-9:50 p.m.
Another local business, GPTO got its start almost 15 years ago when owner Keith Killinger started delivering for Portland restaurants. With just a phone number and a rough-hewn website, Killinger and his new business partner, Rahaman Kargar, offer a slightly different service from most on this list. Rather than order online, diners place two phone calls: One to any local restaurant that offers a carry-out option, and the second to GPTO, who sends one of it its three drivers to pick up and deliver the order to the customer. It is admittedly a little retro-feeling and, on a big ticket, occasionally pricey. The service can also feel a bit understaffed, especially when nobody picks up the phone at GPTO (as happened to me twice in one week). In those situations, I have frequently just driven to collect my order myself. 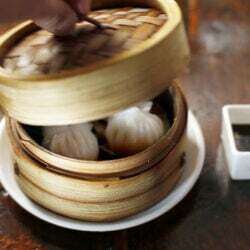 Still, one of GPTO’s big plusses is that it allows customers to order from any restaurant in the area willing to put together a takeout order, regardless of whether they partner with the service. “We’re happy to pick up from anywhere within 20 miles of downtown Portland. 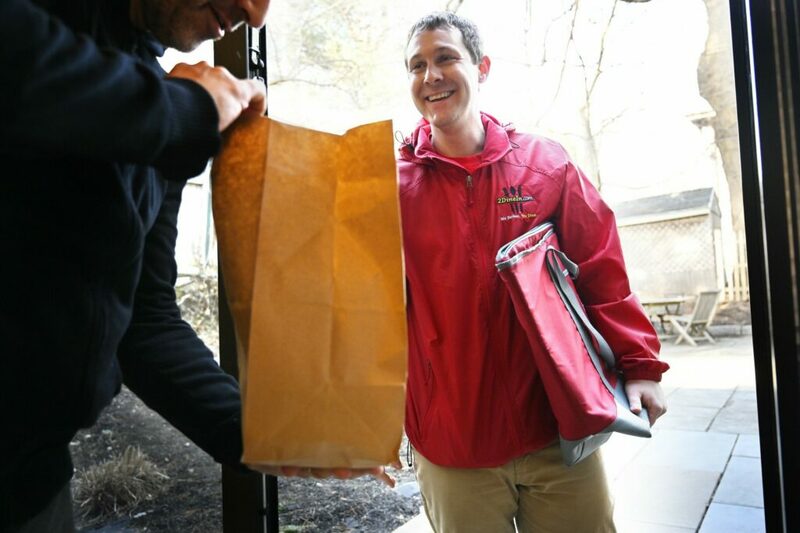 Any restaurant that would love to offer delivery, we’d be happy to step in for them,” Kargar said. 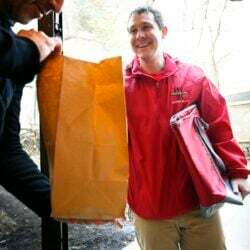 In the nation’s largest cities, GrubHub operates as Seamless, a company founded in 1999 as a catering service for businesses. When the two companies merged in 2013, they created a behemoth food-delivery service that dominated its competition, and in many places like New York, does to this day. In smaller markets like Maine, where we have only GrubHub, the company is (for now) a much smaller player. Part of that stems from its tiny roster of participating restaurants. 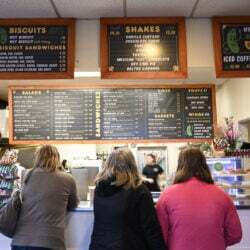 Researching this article, I found 31 restaurants who would deliver to my Portland home, but when I looked more carefully at the list, I found that nearly 30 percent of those were fast food outlets – with one listed separately six times. Now in more than 850 cities across North America, DoorDash is another mobile-and-website-based food delivery service that, at first glance, looks very much like its nonlocal competitors. DoorDash differs in that it offers partner restaurants prime virtual real estate as a form of marketing. When you visit the DoorDash site, this is why you’ll see a scrolling banner touting “Featured National Partners” like Chipotle and Burger King. Even its bizarrely punctuated “Local Favorites!” section suggests Taco Bell alongside a regional chain, Flatbread Company. To find Portland institutions like Bonobo, Vientiane Market and Anania’s Variety, you have to scroll down to the bottom of the page, where you’ll find a complete listing of 137 partners, many of which are fast food or chain restaurants. DoorDash has announced it will launch in Kennebunk and York on May 1. In theory, Postmates delivers anything, anywhere. Indeed, in cities like Los Angeles and San Francisco, you can order groceries and alcohol, as well. Here in Maine, your choices are severely limited. Most options are fast food or casual chain choices, but among these are a few local spots. I placed a Postmates order for a sandwich and a side dish at Bridgeway Restaurant in South Portland’s Knightville neighborhood. And while the order was accepted, Postmates canceled it 30 minutes later when they could not find a single driver to complete the delivery. There are a few things to like about Uber Eats. In theory, couriers are able to deliver items to you by bicycle, scooter and on foot, reducing the carbon footprint of your meal. However, just like its national competitors, many of its current offerings are chain restaurants or fast food. I dug around and ordered salad and a wrap from Portland Pulp. The instant I placed my order, the app displayed a tracker to show me how long my order would be, and where the driver was – a useful visual that shares quite a bit in common with the app of its parent ridesharing company, Uber. My courier arrived precisely when predicted and even told me that he and his wife (who was riding shotgun with him) had moved from Arkansas to drive for Uber Eats because of Portland’s thriving restaurant scene. “Restaurant city of the year!” he cheered as he walked down my front steps. For now, it’s too bad that more of the city’s best restaurants aren’t actually available on Uber Eats. It is also a shame that Uber’s well-documented toxic corporate culture has required such a thorough overhaul recently. The jury is still out on the results.